Have those thoughts ever crossed your mind? When it feels like you’re progressing at a turtle’s speed, it can be easy for thoughts of frustration and doubt to creep in. Especially when it seems like everywhere you turn, there’s another person with their “overnight” success story. It’s like they waved a magic wand, then everything they touched in their business turned to gold. So naturally you think, if only you had the magic wand, everything would be a-ok. Then you’d be more efficient, more effective, more confident. If you had that magic wand, you could finally get over the hurdles that slow your progress. If only you could get your hands on that darned magic wand, you would totally be on your way to living the good life while building the business of your dreams. Here’s some good news for you. Said magic wand does exist. And you can absolutely have your own. Here’s how. Ever watch the acceptance speeches of people who just won some award or special accolade? Most of them are yawn-fests, but there is a unifying theme that’s central to most: A long list of thank-you’s. The honorees give shout-outs, and heart warming expressions of gratitude to all the people who helped them reach their goal. They thank those who helped them rise to the top. These rockstars in their field use their short window of opportunity, when all eyes are on them, to give thanks. Because they know they didn’t make it to the top on their own. Almost no one does. The most successful people have a team of others around them playing various roles to help them be great. And if you want your business to be great, you need a team too. It’s not that they’re incapable or inadequate on their own. Smart entrepreneurs want to give their business the best chance it has to succeed. And they know they can go farther, faster, with the right people by their side. They know relying solely on their own skills will lead them down a long, winding, rocky road on their journey to success. That mismatch is why so many struggle with their goals, both in business and in life. And it helps to explain why many people often abandon their goals and defer their dreams. No bueno. When it comes to your business, a great way to close the gap between your desires, and your abilities is to get a team. Find a team of capable people to play the roles you need to help you reach your goals. Get people to help you behind the scenes. To stand beside you. To whisper needed guidance in your ear. To inspire you to keep going, or tell you when you’re being a royal screw up. You need a team to help get you from where you are, to where you want to go. Your business can do great things for you and the people you serve. And in your relentless pursuit to build your business, give it the best chance it has to succeed. Get yourself a team. And specifically, make sure you get the following four people. 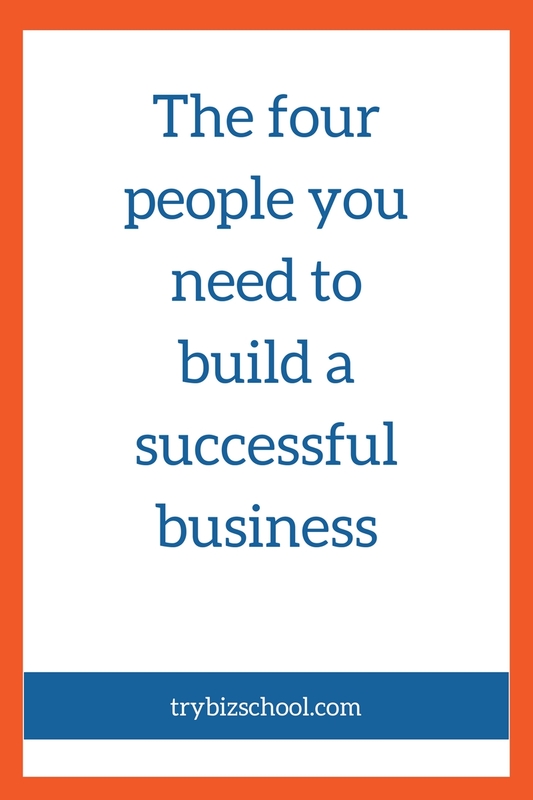 As you build your business, you’ve got to take great care to make sure you get the right people in your corner. Different people play different roles to propel you to your goals. Make sure to fill your team with these indispensable players. Non-violent resistance. That’s the foundation of the strategy Martin Luther King, Jr., used to secure many civil rights victories in the U.S. His leadership in using non-violent resistance to oppose racial prejudice even earned him the Nobel Peace Prize. Even though Dr. King’s philosophy has inspired millions, it wasn’t something he thought up on his own. He was greatly inspired by a mentor, Mohandas Gandhi. He had used non-violent resistance to gain independence for British-ruled India years before. When you’re journeying down a new path, a lot of times you can only see as far as your own existing knowledge can take you. So it’s super helpful to have someone who shines their light far and wide to help you see what’s possible. Gandhi’s success with non-violent resistance showed Dr. King what was possible. And if it worked in India, why couldn’t it work in Alabama? As a business owner, you need someone to help you expand your existing frame of reference. You need a light shiner, a wise and trusted counselor. You need a mentor. Someone to show you what’s possible with your business. Someone to show you the strategies to use to get to your goal. Someone to inspire you to dream bigger. In many instances, a mentor is someone who has already done, or is currently doing what you wish to do. Your light shiner leads you by example. You’ve got to have the right mentor to guide you. A guide who’s example won’t lead you astray. A north star who will point you in the right direction for your values, and your purpose. Look for a mentor who is currently where you want to be, or whose career and trajectory is one you admire. Observe people in your industry. Or even folks who’ve been successful in a broader field of work that has similarities to yours. Don’t feel like you have to limit yourself to people who are still living. By the time Dr. King got started in the civil rights movement, Gandhi was already dead. The light from strong legacies are enduring. Watch what your mentor does and doesn’t do. Pay attention to how her customers respond to her. And then dig in deeper to understand why her customers react the way they do. Creating a personal relationship with your mentor is ideal. Direct interactions with your guide will enable her to give you pearls of wisdom to steer you down the right path. But if you can’t connect with your light shiner live, don’t fret. You can study from afar. Read her work, watch videos, interviews, or anything else you can find that gives insights into keys to her success. Don’t just stand in awe of your light shiner. Take the lessons you’ve learned from her experiences and apply them to make them work for your business. The idea isn’t to become a carbon copy of your mentor. It’s for you to be a better version of you, by using her experiences and guidance to shape your approach. With twenty-two gold medals, Michael Phelps is the most decorated Olympian of all time. Even with his natural abilities, and ideal physique, a big part of what helped him do so well was his coach. Your trainer gets you ready, and in the best possible position to reach your goals. Work with someone who fits your personality. If you respond best to tough love, find someone who gives you that kick in the pants you need. Or if you need someone who’s more patient and nurturing, make sure you get a coach that provides that. Bottom line, you need someone who can get you results. Someone who knows your strengths, weaknesses, hang-ups, and anything else that may prevent you from getting where you want to go. And of course, they need to be able to find a way to help you get over any bumps in the road. Once you’ve got the right trainer on your team, be sure to communicate with them what your goals are. With a GPS, you punch in the address, and the system gives you directions on how to get to your destination. If you don’t know where you want to go, the GPS doesn’t know where to take you. The same goes for your trainer. You tell him the goals you are trying to reach, and he will create a plan to get you there. When using a GPS, it gives instructions on when to turn and merge. If you don’t follow the instructions, the GPS then has to “recalculate” to devise an updated plan to get you to your destination. Once your trainer maps out a plan for you, you have to do the work they assign. And you’ve got to do the work both when you’re working together, and when you’re on your own. Otherwise, you may not see the results you desire. A while back, I had every intention of going for a swim workout at the gym. I had planned for it all week. I was looking forward to it. But when the time came for me to go, my bed wanted to hold me hostage. It felt too good! I started to make excuses for why it was ok if I skipped my workout that day. Then I got a text from my sister. Your peers hold you accountable. They won’t let you slack off or make excuses. They push you. They fuel you. When you are weak, the right peers will help make you strong. Your peers need to have similar goals as you. They don’t have to be exactly the same, but definitely in the same ballpark. That way, you can have discussions about your challenges, and successes as you go about building your business. And you can do it without having to explain all the details about why what you’re experiencing is important or significant. Your peers get what you’re going through, ‘cause it’s their world too. And if for some reason you fall behind, or get tripped up, they’ll know enough about the path to help say or do the right things to get you back on track. You don’t need a crew of people who are all like you. The people in your circle should have varying styles, talents and gifts, so you all can help each other. When one person is strong, he can give suggestions to others in the group who need to improve. Make sure you’re surrounding yourself with people you can learn from. That’s the best way to ensure everyone in the group is getting the most value out of being together. You’ll get the best results from your peers when you talk consistently. Then you can assess each other’s progress, hold each other accountable, and provide the needed support to keep you going. If too much time passes between when you get together, you’ll have to spend a lot of up front time catching everyone up on what’s been going on. There’s no set rule on how often this needs to be. But find a rhythm and format that works well for the group. You’ll get better results when you have a preset framework and time to meet. You need at least one person in your life who won’t let you quit. Someone who believes in you, and your vision, even when you don’t. So whether it’s a high five, a listening ear, or even just a knowing hug, your cheerleader has many techniques. Your cheerleader, will be the one to give you the support you need to cross the finish line. Who do you have in your world that loves you unconditionally, whether or not you’re blazing trails? Who loves you simply because you make their life better? Who do you know, that genuinely, just wants to see you to be your best? That’s the cheerleader you want on your team. That’s the person who will be able to withstand your rants, and tantrums, and other irrational moments. It’s easy to have people cheer for you when you’re doing well. But your most effective cheerleader will be someone who can breathe life back into you, when your dream feels like its at death’s door. As you work to make your dream your reality, include your best supporter on your journey. Share your vision. Tell her about your successes, frustrations, and progress. The more she gets invested in your success, the easier it will be for her to push you forward. Even when you don’t feel like moving. Your cheerleader should be someone who knows you well. Well enough that they always show up exactly when you need them. Whether it’s through an encouraging text message, or an inappropriate joke to make you not take yourself too seriously, your cheerleader always knows what to do. You need to make sure you’ve got a cheerleader who is on the job both when you call, and when you don’t. Close your eyes. You just got an award as the result of making life better for those you serve. You’re in your fancy clothes. You just stepped to the podium. And all eyes are on you. Alright, who are you going to thank? When it comes time for you to talk about how you achieved your goal, who are the people you will shout out for helping you get there. Who are the people you will recognize as being essential to your success? Because when you activate your magic wand by assembling a rock-star team, success in your business will come. Your dream business is too important for you to go it alone. Hi, Sonia, thank you very much for the great light. I’m actually at the point to create my own online business and those advices are really welcome. Sorry for my bad english, I’m not english speaker. Best wishes to you with your new online business. I hope you’re able to get these 4 people lined up to help you along on your journey! Thanks Sonia for all the great tips. Finding the right people who value what you do is the real key. Hey Lancia – thanks for stopping by. Yes, you’re right. You do need to invest time in finding the people who value what you do. That’s why I think its important to evaluate the circles you interact in. For instance, I found some of my own “iron sharpeners” by going to events with other people who were trying to accomplish the same goals as I was. It takes a little effort, and you’ll definitely have to step outside of your comfort zone, but getting the right people in your circle is totally worth it. Sonia, This was a GREAT article!!!! Thank you for writing it. Hey Sharron – thanks so much for your feedback! I’m glad you enjoyed it. So do you have your 4 people lined up? I came across this blog via Henneke, Enchanting Marketing. Read the first few paragraphs of this post and couldn’t stop at one. (I’m hurrying over to the next). As a first-time commenter on your blog, Sonia Thompson (and having read the About page too), want to appreciate the good work. This article is just on point. Thanks for doing this. I guess I’m so guilty of always wanting to go it alone; believing the best would happen only that way. Alas! I’ve hit some blocks in online business as a greenhorn, and of course, I’ve had to pick myself up more tender and doubtful. However, I’ve found what works for me (while still learning to believe in my dream) is stalking the few online influencers who resonate with me. Learning what they do and replicating creatively. While it’s fun to do that, when is the perfect time to quit nursing the fear of building something worthwhile and just do it, Sonia? Especially when your online ‘forbears’ are super-duper A-listers? (The Copyblogger kind, you know). Thanks for sharing, Sonia Thompson. Hey Busayo – welcome to the blog, and thanks for your comment! I totally get where you’re coming from, when it comes to going it alone. My initial tendency is to always try and do something on my own first. But what I have come to realize, is that other people have lot’s to offer. Sounds like you’ve already got some light shiners in your world. People who you’re studying and learning from. My recommendation to you if you want to kick things up a notch, is to move things forward with at least one of your A-listers and start to build a relationship with them. Even the super-duper ones tend to be really nice people, and open to connecting with those in their audience. It may seem a bit scary at first, and it does take time to build a meaningful relationship – I’ve found the best way to go about doing it is to just do it. Send an email, a tweet, join a course, or go to a conference. Hope that helps, and I’m thrilled that you enjoyed the post. Hope to see you here again! This is great Sonia. Thanks for the great inspiring work. As I was reading ,I felt that you were talking to me. It touches every corner of an aspiring entrepreneur. Encouraging and motivating. Team building , mentorship ,support, focus and hard work very important in every level of success. Hey Vincent – thanks for stopping by and leaving a comment!